It is going to be very difficult to set your bike up in one day unless you wish to spend a lot of time in the saddle. Therefore I have split up this article into different days to make it easier to read and carry out. I bought myself a Yamaha YZF R1 bike which was supposed to a top handling bike. It was not. The bike was reluctant to turn. I took the bike to a club racer mate of mine and he had a test ride and then suggested that I increase the rebound (????) I turned the rebound (???) screw and it seemed to improve the bike handling. I turned it a bit more and it went back worse. I felt that since I had already fiddled with one of the settings, I might as well try other suspension settings. I tried suspension setting from motorcycle newspapers, sports bike magazine, top racing websites and forums and they were all crap. In fact two sources never recommended the same setting for my bike and no one adequately explained how they got those settings. I felt I had to find my own suspension settings for my bike. In order to do so, I had to understand how it worked and this article will attempt to explain how I set up my bike and how you can too. DAY 1 - What is “suspension” all about? Your bike suspension is designed primarily to absorb the imperfections in the roads, and ensure that tyres keep contact with the roads. Most bikes suspension are based on a spring like you would find in a pen, mattress or trampoline but much stronger. To stop the spring from bouncing the tyre like a yoyo; the rate the spring moves up and down is controlled by “dampers”. The suspension for your front wheel is independent from the back wheel and can react differently to road and riding conditions. Before I touched the bike, I located the handbook for my bike as supplied by the manufacturer. The handbook contains details on what can be adjusted and where on the bike the knobs and screws are for setting up your bike front and rear suspension. Also it details the manufacturers recommended suspension settings for your bike. If you have aftermarket (third party) suspension, contact them. Note that compression and rebound are part of damping. After I had established what I can adjust on my bike and how to adjust it, I got a pen and paper and wrote down my bikes current settings so that I can return the bike to it if I make a mess of things. On my bike, this meant counting “clicks” as I turned the screws for the compression and rebound clockwise or anti-clockwise. Preload is easier to note and record as you can see what “notch” the rear spring is on and what “ring” the front is on. The manufacturer has spent a lot of time and money on research and development and they have a financial incentive to ensure that my bike handles well, therefore the manufacturers recommended suspension settings for your bike will not be that bad. Compare what your current settings are for your bike against the manufacturers setting. If they are different, and you think your bike could handle better, have a go at setting your bike to manufacturers recommended settings. You should be able to fiddle with your suspension and bring it back to the settings recommended by the manufacturer or your original setting before you go any further. Do not read any further unless you are competent with the above and acknowledge that this whole article is purely for information only. Please do not fiddle with your bike, then injure yourself and then blame me. To set up your bike you will require the proper tools as recommended in your bikes handbook, usually a long screw driver, spanner for the front and a funny looking tool for the rear preload and tape measure!!. You will need patience and time. It is best to set the bike up where you are most likely to use it i.e. on the roads or race track.. Ensure your bike is in good working condition, including replacing dodgy fork seals, lubricating linkage, and changing fork or shock oil and you have correct tyre pressure . If you are unsure of your tyre pressure and it is a track bike use 32psi front, 30psi rear. If your bike does not have some of these setting then you will have to compromise on the setting of your bike or buy aftermarket suspension if necessary. You really should set up your bike in the right order. It is best to start with the preloads, front and rear as this is based on your weight and relatively easy to set up, then work your way down. Below is a more detailed explanation. This is easy to set up but can be a bit confusing so just follow the steps one at a time. Step 1: First find the fully UNLOADED length of your rear suspension. Put your bike on its centre stand. If you do not have a centre stand find a means of lifting the rear wheel up under the engine so that there is no weight (including the weight of the bike) on the rear axle and wheel. Measure the distance between the rear axle and a fixed point directly above like a bolt or mark. Note this measure measurement. Do not use a rear wheel bike stand as there is still the weight of the bike on the swing arm. Step 2: Find the NORMAL length of you rear suspension. This is amount the suspension drops under the weigh of the bike alone without the rider. Put the bike on level ground and bounce it up and down to free any stickiness. Measure between the same two points as above, i.e. the rear axle and the fixed point directly above. Step 3: Find the fully LOADED length of your rear suspension. This is the length of the suspension with the rear wheel on level ground and the rider seated on it in his normal riding position in full biking garb. First bounce up and down on the seat to loosen the suspension then get into your normal riding position with all weight on the bike and both feet on the bike. To prevent yourself from falling of (if you have not already) lean the bike against a wall and get your mate to measure between the same two points as above i.e. rear axle and the fixed point directly above. Next thing is to understand a couple of buzz words. “Static sag” and “Rider sag”. RIDER SAG is the difference steps 1 and 3. This is the amount the bike drops when your heavy arse sits on the bike. STATIC SAG is the difference between step 1 and step 2. it is how much the bikes weight acts on the rear suspension or how much you can lift the bike rear without the rider on it before it tops out. A top racing suspension company suggest that rear wheel rider sag should be around 30-40mm and static sag should be around 5-10mm. However this many vary depending on your bike and manufacturer. The more rider sag you have, the softer the bike suspension will be. I personally use 35mm for road and a few track days use. Therefore if your rider sag is less than 30 mm then your preload is too hard, if it is more than 40 mm, then it is a bit soft. Once you have set your rider sag as close as possible to 30-40 mm, next check your static sag. If you have more than 10mm then you may need stiffer springs. If however, if your static sag is less than 5mm or you have no static sag then your springs may be too hard for your weight. If you have to compromise then try to have at least a bit of Static sag in order to stop the bike from topping out. Note that books, videos, media and pub acquaintances will all have different opinions on the naming and figures quoted above (and below). I find that I get fewer complaints with the current labelling system than I would with other labelling systems. Avoid being obsessed with numbers and naming systems. I will try to explain the underlying principles of setting up your own bike. There are too many scenarios and permutations surrounding the effects of tweaking each setting that it would take me forever to cover them all. Therefore I will only touch on a few of the more common effects. 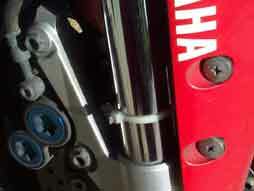 Some people set the front suspension based on rider sag and static sag. This is especially useful in determining if you need softer or stiffer springs. Use the same system as above to determine Rider sag (35-48mm) and Static sag (25-30mm). However I prefer the below method to optimise my current original front forks. The damping, both rebound and compression are best adjusted after riding your bike and feeling how it handles to you. You cannot use your mate’s settings. The reason why there is so much debate and controversy regarding suspension set up is because it is a personal experience and depends on how and where you ride your motorcycle. Some people, media and websites will charge or tell you what they think is best for you whilst amongst top racers it is a closely guarded secret. You have to find your own settings that you are comfortable with and take notes as you experiment with different settings. Setting the right amount of damping depends on the type of bike, how you ride the bike of bike, and shape and pressure of tyres you use. Also it depends on your riding style and how much suspension travel you want at any particular moment. This article will try to explain what to look out for and how to tweak it. If you can adjust the damping but cannot adjust the rebound and compression separately, then you will have to find a compromise between the two for your bike. If you run out of adjustment, then depending on if the damping, either rebound or compression, is too slow or too fast then you may need to change the damping oil to thinner or thicker suspension oil relatively. Note that your suspension will handle differently under different conditions i.e. high or low speed, wet or dry conditions, therefore experiment with setting up your bike under the conditions you would like to use them. To start with, set your bike damping rebound and compression to your manufacturers or your preferred setting. You need your front compression under braking and when riding over uneven humps. You want your front suspension to compress slowly and controlled when you break. As your bike “nose dives” under braking, it transfers more weight over the front wheel. This helps slow the bike quicker. If the front suspension compresses too quickly (too soft) you risk the suspension bottoming out and then your bike will feel vague and since it nose dives too quickly the back wheel may loose contact with the road and move sideways. On the other hand when compression damping is too high the suspension can't react quickly enough to compress over bumps and will skip and chatter. You will have an uncomfortable ride and your braking is compromised, especially in the wet. Another important aspect of front compression is when you brake just before a turn. As you brake before the corner, the bike will naturally “nose dive”, this will shorten the wheel base and alter the geometry of the bike making the bike turn quicker into the corner. It is important that your bike compresses predictably and safely in a corner/turn. Go for a ride on your bike and try braking and turning into corners at different speeds. This will cause a bit of nose dive so try different setting. If your bike bottoms out, increase the front preload. See preload notes above. Keep notes. An alternative to manufacturers setting for front rebound is to place your bike on level ground and have your mate or rear wheel stand support the back of the bike. Press hard on the top of the yoke without pressing the brakes and let go. The suspension should rebound to its original position within a second. If it takes more than a second then you need softer rebound but if it takes less than a second or it rebounds past its original position then you should make your rebound harder. This method may work but really it is too simplistic for real world riding. One critical area where you want your front rebound to work well is through them corners and turns. As you fly down the road and brake before or into the corner, the front suspension compresses, then as you let go of the brakes, the front wheel will rebound fully. You do not want your front end to sit up too quickly especially mid corner. It does not matter whether you brake before the turn but this is more critical if you brake into the turn. if you cannot adjust the rebound and compression separately but you can adjust the damping, then you will have to go for a compromise. Since most accidents happen in a turn, then I will suggest that you set it up for cornering. Try to get the bike to enter and exit a corner with minimal rocking or seesawing to the front end. These setting should be ok for bumpy tarmac. If your bike uses clicks to adjust damping, and you want to adjust your damping settings, do not simply turn it a few clicks till you think you have the right new settings. Fully count the clicks in to ensure you were on the right old settings then count it out to the right new settings. Example you think your front compression is on 5 clicks out and you want to try 7 clicks out. Do not simply turn it 2 clicks out. Count the 5 click in, and then count the 7 clicks out. Do not adjust more than one setting at a time unless it is to a previously recorded set up as you will not know which setting cause the most effect. I commute to work and I used to make one small (a click) adjustment a day. Sometimes I would leave it for a week because the conditions where not right to feel the new settings in action. On the track, I would suggest one setting change per session, minimum. Now you have a comfortable bike with adequate suspension balance. Now let’s fine tune it a bit. Again there are no tricks to setting up your rear wheel suspension, you have to understand what causes your rear suspension to work. Since rebound occurs after compression we will deal with compression first. Like with the front wheel; if your rear compression is too hard you will have an uncomfortable ride because the rear wheel simply bounces off bumps and ripples in the road also giving a vague “feel”. Conversely, if it is too soft, you may get excessive “squatting” under heavy acceleration causing the bike to feel lethargic or even “bottoming out” on those rough roads. When you accelerate, you need a bit of rear end squatting to give the tyres a chance to get some traction and absorb excessive power to the back wheel. However, it is that squatting action under heavy acceleration that can cause problems when coming out of corners. To set your rear compression damping up properly, it is best to have the front end sorted out first. That way you know you that your entry into the corner is as smooth as possible. Then you want to be able to put on the gas as you exit the corner and your bike should hold its line and inspire confidence. If you have reached this point and found out that your original set up was the best then oops sorry. At least you have a few more buzz words to drop in the pub with other bike mates. First get your owner manual out and familiarise and compare your current suspension settings with the recommended settings in the manufactures hand book. Still not satisfied? Then set-up your preload, front and rear, so that you can use as much suspension travel as possible when riding your bike. This is based on your weight, so if your weight fluctuates then keep an eye on it. Next adjust your damping so that your suspension does not compress or rebound too fast or too slow to upset the bike and be uncomfortable. I believe that if you can get your bike suspension set up for cornering then it should be OK on a straight line. You have let go of brakes, adjust front rebound so that the front forks extend at a controlled rate allowing you to keep your line. You want the rear end to squat a bit as you apply the power. Make sure that the rear rebound setting keeps the rear wheel in contact with the road. Note: this image is only for illustration only. Your braking, turning and exit points and lines may vary, especially in the wet. The point of this article is to educate you on how your suspension works so you can attempt to sort it out yourself. You should be able to feel the bike through the handle bars and the bike seat and be brave enough to note down the current settings and have a go at altering it to suit yourself. I found that it is difficult to set up the bike for all condition. I recently changed my front brake pads and they were biting harder which made the bike nose down quicker. As summer approaches, I like to ride a bit faster. My weight is fluctuating. All these scenarios have caused me to change my setup. Top racers alter their setup at every track. I wrote this motorcycle suspension article years ago and people still read and email me. Sadly I cannot reply to all emails, as I frankly do not know what to say. Basically I am chuffed anyone actually read it. 5 January 2004 2.3 Major typo errors spotted by "Michael from Sweden" on the issue of sag. Added illustrations as a result. 4 January 2004 2.2 Split write-up into "Days" to make it less daunting to newbies and easier to read. 5 April 2003 1.1 Illustrations added. First batch of corrections to naming and grammar. This document is copyright of Biodun Sean Onipede 2003. You may distribute it but please do not delete my copyright information. If you do so I will sue you. If you want to publish this information on your website, please notify me and I will probably agree for a link exchange. This article is for information only.